Inspired by the beauty of nature and the spiritual work of movement therapist Bolina Thompson and clairvoyant medium Phil Phillips, this contemplative album will take you on a series of sacred meditations into the depth of your own soul. Featuring Tron Syversen on piano, the angelic voices of Helene Edler Lorentzen and Siri McAlpine, as well as a symphonic ensemble of musicians on strings, flute, oboe, English horn, French horn, trombone, violin, and cello, these four tracks represent relaxation music at its most sublime. So get ready for over an hour with long, melodic pieces that take you deep into your fantasy world. Improvised music made for meditations. All music was made in the present. 2 pieces are made for meditations with a Danish therapist and the one for a meditation with Phil Phillips, all while the meditations were read. The meditation with Phil Phillips was made in front of a live audience at the "Unity Centre" in Oslo. Reached number 5 on Zonemusic Reporter Top 100 in 2015. 4 tracks, total playing time 62:19 min. 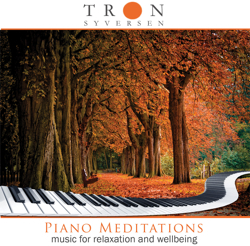 Bookwatch: "Norwegian pianist Tron Syversen stirs the heart and soul with his contemplative music, encouraging introspection and spiritual renewal. Highly recommended!" AMAZON and iTunes: "The music envelopes you in a floating bubble of gentleness that is hauntingly-lovely and stress-reducing at the same time"
Bluewolf Reviews: "Whatever manner you would like to choose for your relaxation, Piano Meditations will work with you, wash you in dulcet tones and refresh your inner being." Music Discussion: "No matter whom Syversen works with, the result is high-quality, refreshing, relaxing new age music. Quality through and through." Spirit Passages: "Appealing, powerful and hauntingly beautiful. We recommend this very highly." Eight Notes: "This is sublime stuff, gentle and relaxing enough to make your socks roll down"
Tango: "Norways Tron Syversen has become one of the most respected keyboardists of new age music in the world." Keys and Chords: "An excellent CD to come to rest with, or to sleep better. Can be used in conjunction with massage, yoga or aromatherapy"